Watch for Motorcycles in May! | Hupy and Abraham, S.C.
Watch for Motorcycles in May! May is Motorcycle Awareness Month and safety advocates across the country are ramping up efforts to keep riders safe, and remind all motorists to share the road with one another. In 2014 alone, 4,586 motorcyclists were killed in crashes, accounting for 14 percent of the total highway fatalities that year. 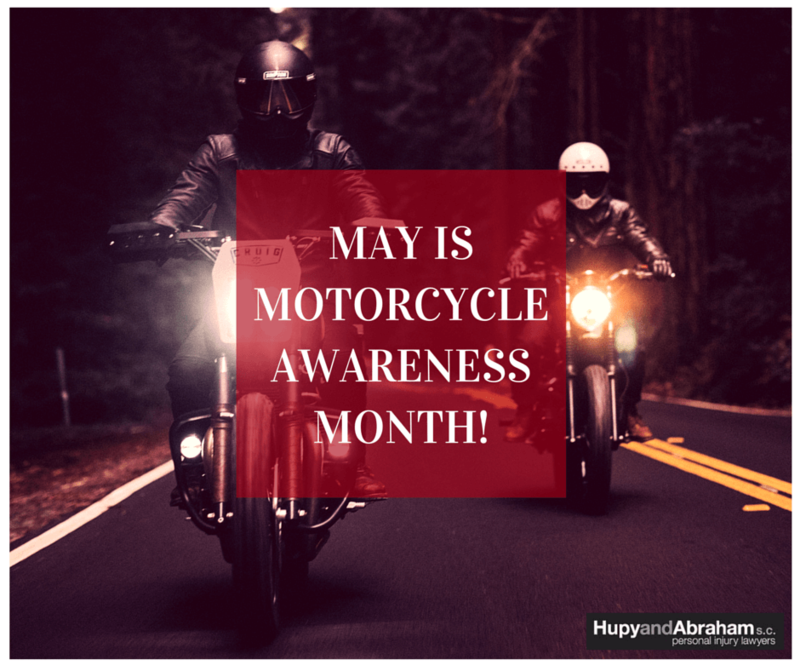 As riders and advocates ourselves, Hupy and Abraham will spend the month of May reminding the public to be alert and always Watch for Motorcycles. Motorcycles are smaller than most vehicles, and they can be difficult to see, causing other drivers to misjudge their speed and distance. Demonstrations have shown that from a far enough distance, something as small as an air freshener hanging from a rearview mirror can completely obstruct a driver’s view of a motorcycle. But in a court of law, failure to see a motorcycle is not an excuse. Whether they saw them or not, if drivers cause a crash, they may still be legally responsible for any injuries sustained by the rider. Drivers have a duty of care to everyone who legally shares the road with them, and this includes motorcyclists. Allow a motorcycle the full width of a lane at all times. A motorcycle is a small vehicle and their riders still have the same rights as any other motorist. Signal when changing lanes or merging to alert riders of your intentions. The Society of Automotive Engineers (SAE) conducted a study that found 47 percent of drivers don’t use their turn signals before merging. Check all mirrors and blind spots for motorcycles, or any vehicle, before changing lanes or merging with traffic, especially at intersections. Leave additional space when driving behind a motorcycle, giving them more time to react or stop in an emergency. Never drive distracted or impaired. It’s a danger to everyone. Safe driving practices and cooperation from all motorists will help reduce the number of injuries and fatalities that occur each day. And by raising motorists’ awareness, both drivers and riders will be safer sharing the road. If you would like to support Motorcycle Awareness Month, request a free Watch for Motorcycles sticker from Hupy and Abraham today and help save lives! Hupy and Abraham is the law firm that has represented over 3,000 injured riders. If you’ve been injured in a motorcycle accident, our experienced motorcycle accident attorneys are here to help. Contact us at 800-800-5678, or start a live chat 24/7 at Hupy.com.